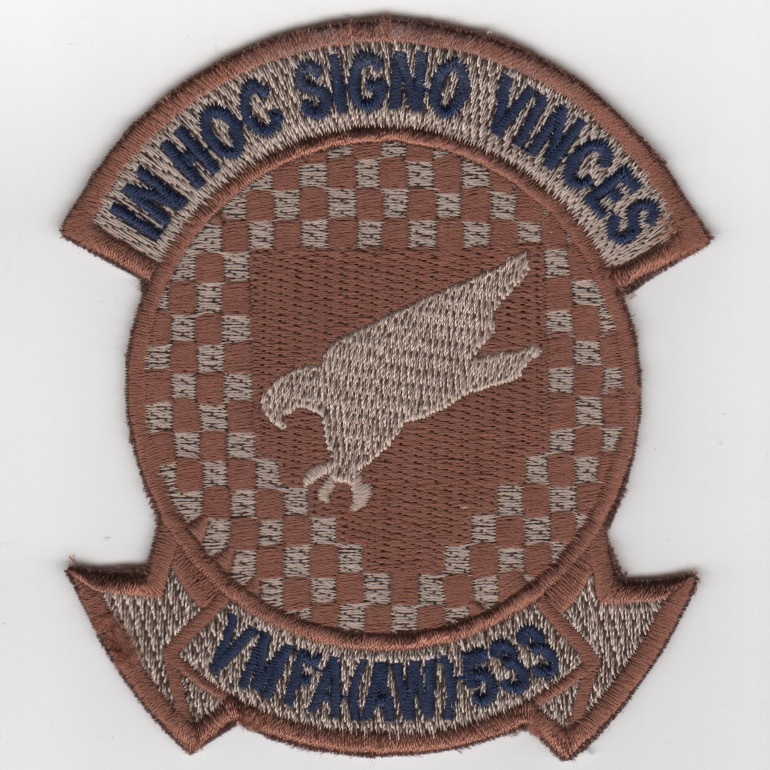 This was the 'blue/white' checkered version of the squadron patch for the VMA(AW)-533 'Hawks'. They flew the A-6E Intruder out of MCAS Cherry Point, NC under the watchful eyes of MAG-14. They deployed to Sheik Isa air base, Bahrain for Operation Desert Storm. They have since converted to the F/A-18D Hornet and are currently stationed at MCAS Beaurfort, SC. This is the 'history' patch for the squadron. 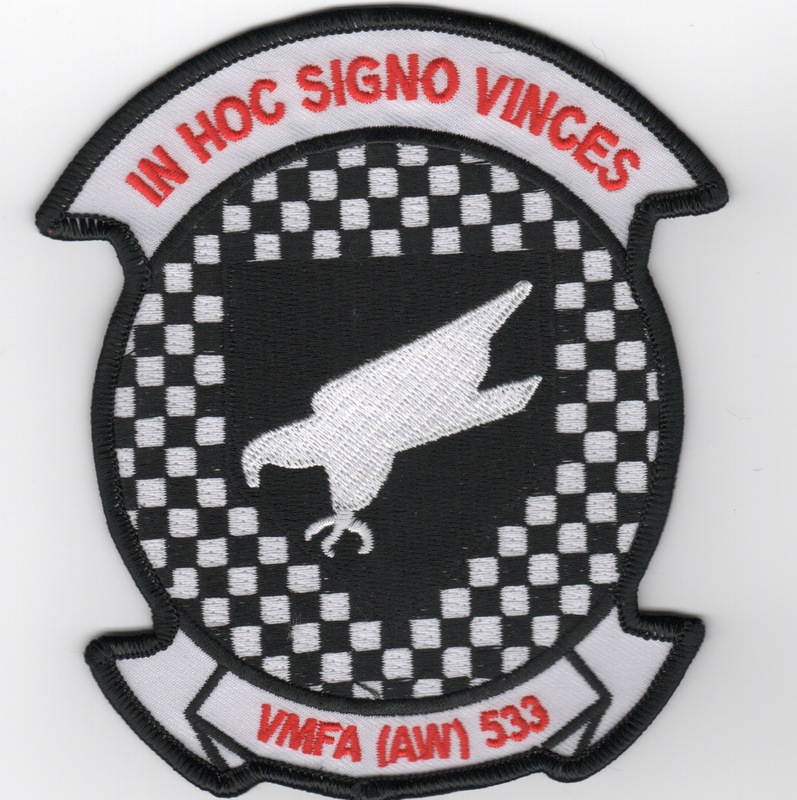 This is the 'black/white' checkered version of the squadron patch for the VMFA(AW)-533 'Hawks'. They flew the A-6E Intruder out of MCAS Cherry Point, NC under the watchful eyes of MAG-14. They deployed to Sheik Isa air base, Bahrain for Operation Desert Storm. They have since converted to the F/A-18D Hornet and are currently stationed at MCAS Beaurfort, SC. This is the 'black/white' checkerboard version of their squadron patch. Marine All-Weather Fighter Attack Squadron 533 (VMFA(AW)-533) is a USMC F/A-18 Hornet squadron. Also known as the "Hawks", the squadron is based at Marine Corps Air Station Beaufort, SC and falls under the command of Marine Aircraft Group 31 (MAG-31) and the 2nd Marine Aircraft Wing (2nd MAW). 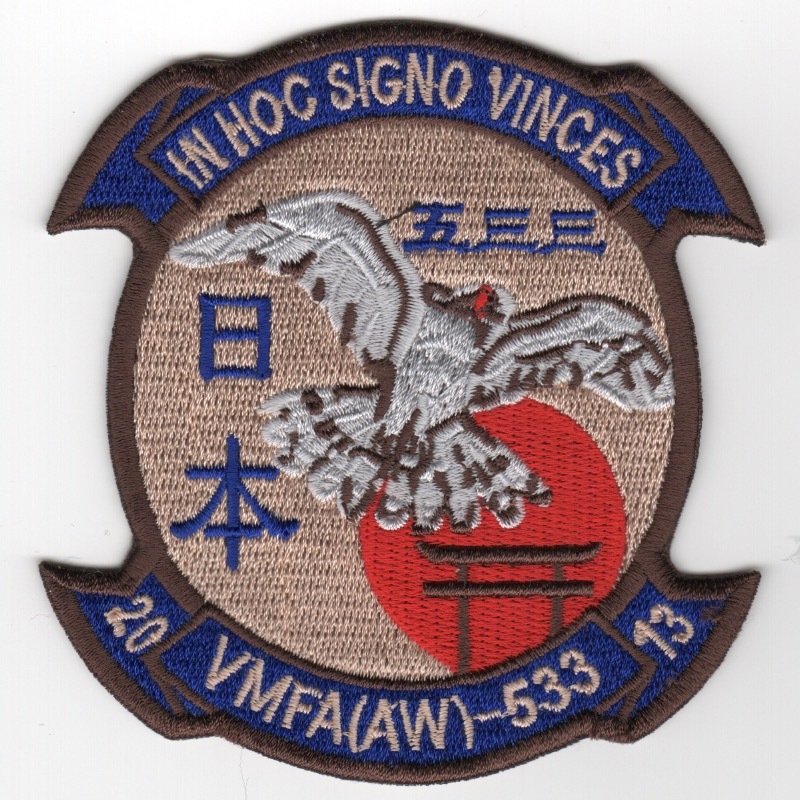 This version of the squadron patch depicts the Japanese Sun/Script and was found in a Korean embroidery shop. No velcro attached. Marine All-Weather Fighter Attack Squadron 533 (VMFA(AW)-533) is a USMC F/A-18 Hornet squadron. Also known as the "Hawks", the squadron is based at Marine Corps Air Station Beaufort, SC and falls under the command of Marine Aircraft Group 31 (MAG-31) and the 2nd Marine Aircraft Wing (2nd MAW). This is the desert version of the squadron patch and was found in a Korean embroidery shop. No velcro attached. The 'Hawks of VMFA(AW)-533 operate under MAG-14 out of MCAS Cherry Point, NC. They flew the A-6E Intruder (great bird) and deployed to Sheik Isa airbase during Desert Storm. They have since converted to the F/A-18 Hornet. The 'Hawks of VMFA(AW)-533 operate under MAG-14 out of MCAS Cherry Point, NC. They flew the A-6E Intruder (great bird) and deployed to Sheik Isa airbase during Desert Storm. They have since converted to the F/A-18 Hornet. This patch was created for their participation in the 1999 Operation Allied Force (OAF) deployment in the Bosnian Theater. This patch does not come with velcro attached. 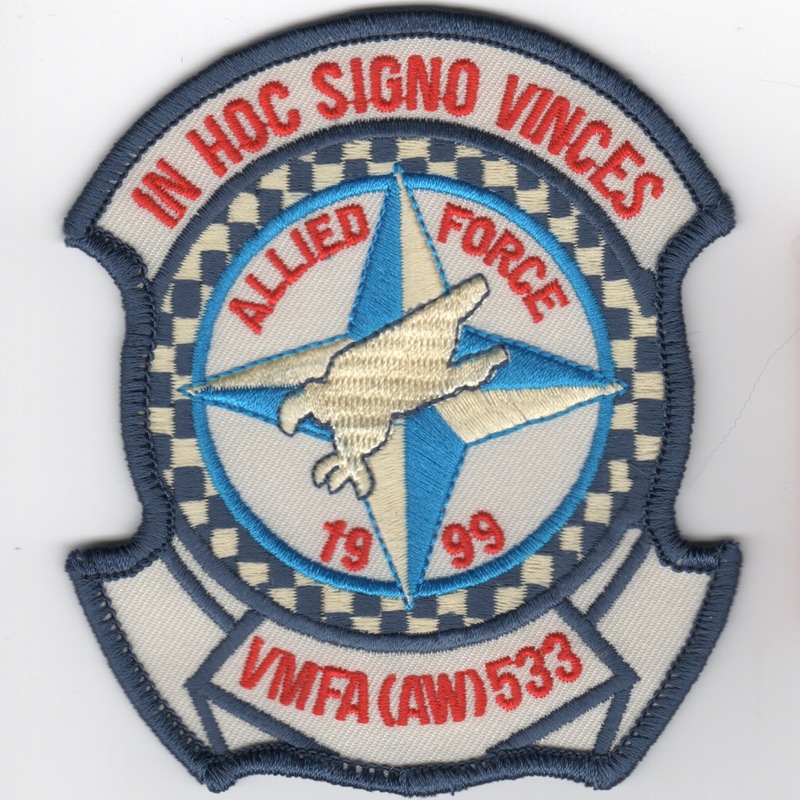 Homepage | Order VMFA-533 Patches!